Economy Door & Room Signs. Made from rigid plastic Fpvc and available in a range of styles and sizes. Add you logo or tag line at no extra cost. Supplied ready to fit & complete with colour keyed fixings. Installation services available on request. Call us Now ! to talk to us about your signs. Our 'Economy' Panel Signs and wall signs are built to look good, to last and to be safe for years to come. These signs are based on the most popular signs that we sell. 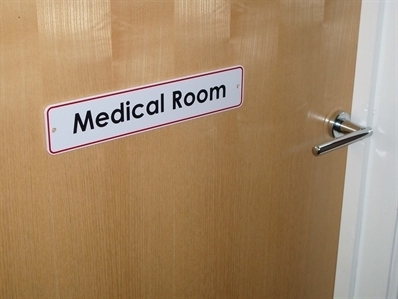 'Popular' Panel Signs are designed and built specifically for use in Surgeries and are are all about the image of the Surgery. Constructed from solid and rigid plastic, these signs are available in a broad range of sizes and styles and in any of our 28 stock colours. They are also available to match any of over 100 standard Ral colours and can even be matched to almost any Pantone or vinyl colour.